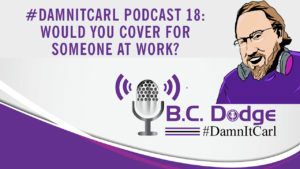 You are here: Home / #DamnitCarl / #DamnItCarl Podcast 18: Would You Cover For Someone at Work? On this #DamnItCarl podcast B.C. Dodge asks – would you cover for someone at work? B.C. talks about a job that he applied for at Wal-Mart, and didn’t get, back in the late 1990s. The reason he didn’t get the job was because of the question of would you fire someone from work if your boss told you to or would you move them, so the boss couldn’t see them. This always make B.C. think of a guy he worked with who had a drinking problem. Yes, he could have called the owner of the company to complain. But rather than do that, he had compassion on the man and tried to help him. The truth is you never know what demons someone is facing. They could be smiling at you and laughing with you (not at you, because that would be rude). But they could go home at and cry themselves to sleep…you don’t know. That is why it is better to show a little bit of compassion for our fellow man and try to help them through the rough times. Your friendship or encouragement could very much mean life or death to someone. We don’t say this to exaggerate, especially since the suicide rates are on the rise. The words of encouragement that should come from this episode are simply that you should share a simple with everyone, it might brighten their day.